WYNN is the innovative literacy software tool designed to enhance success for individuals with reading challenges and writing difficulties. By using the software’s bi-modal approach — simultaneous highlighting of the text as it is spoken — WYNN transforms printed text into understandable information that benefits readers of all ages. WYNN is the innovative literacy software tool designed to enhance success for individuals with reading challenges and writing difficulties. WYNN was developed with the help of special educators and individuals with learning difficulties such as dyslexia, dysgraphia and aphasia. By using a bi-modal approach – simultaneous highlighting of the text as it is spoken – WYNN transforms printed text into understandable information that benefits readers of all ages including English Language Learners (ELL), struggling readers and children with ADD (attention deficit disorder) or ADHD (attention deficit hyperactive disorder). WYNN Wizard, our premier product, is scanning and reading software. It includes optical character recognition (OCR), the ability to scan printed pages and convert them into electronic text. Speech synthesis enables this scanned text to be read aloud. 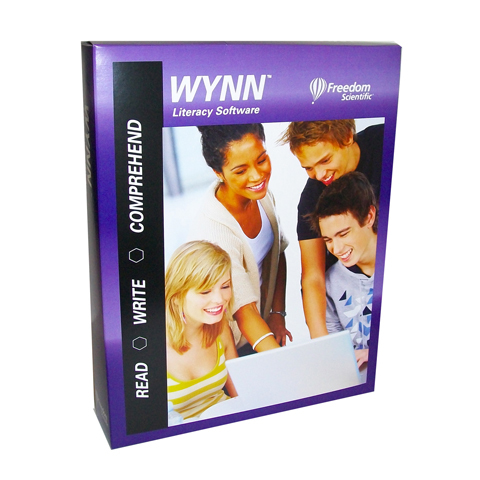 Additionally, WYNN Wizard can read word processing documents, Adobe Acrobat PDF files, text files, and the Internet. WYNN’s features and benefits appeal to individuals of all ages. Educators, students and adults benefit from its powerful and flexible features. The detailed chart, “Reading and Writing Roadblocks, How WYNN Can Help,” describes specific learning disabilities and which features in WYNN assist the learner to become more successful and self confident. 30-day money-back satisfaction guarantee and limited 90-day warranty against manufacturing defects.